Above is just one example of what can be done within limited space to increase storage density and order picking efficiency. This design creates 1,000 additional square feet and 10,000 pick faces. That's a lot, and could be even more. 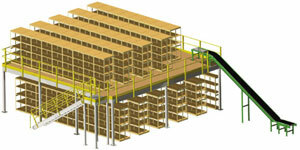 This typical layout should help you consider ways to design a high-density storage system, to help you improve storage density, ergonomics, pick speed and inventory control. The mezzanine is configured with an incline, reversible belt conveyor to help you transport parts and bins from level to level with ease. It could be fitted differently--imagine carton flow on the floor, or an in-plant office on the top, some conveyor, or even using a shelf supported, rather than structural mezzanine. Since the sky's the limit, it depends on your needs. You can put nearly anything on a mezzanine, and you can deliver product to it a number of ways. Mezzanine is 32'-2" x 31'-5-1/2" (1,011 sq. ft.) with 9' clearance below the structure. Steps are 36" wide, 11" deep, and have a 7" rise. Stairway landing is 42" x 42" and features a diamond-plate deck. Guardrail is 2-1/2" by 2-1/2" square tubing uprights and 1-1/2" diameter horizontal tubing. This provides a solid platform for you to create customized, high-density, high-speed product storage. High-density, heavy-duty single rivet style shelving adds big storage in a small footprint. Shelves have 36 cubic feet of storage space each, including top-shelf load. In all, 198 shelving units provide 7,128 cubic feet of storage space--3,960 on the floor level and 3,168 on the mezzanine level. If equipped with 6" x 18" shelf bins (not included), you could have 10,000 pick faces. Reversible center-drive SBI floor-to-floor incline conveyor efficiently exchanges cartons between levels. It's 23'10" long, 18" belt width (overall width of 24"). It's equipped with an adjustable double nose-over at the discharge end for smooth transfer from incline to horizontal plane (in this case, it connects to a gravity in-feed conveyor for smooth product handling). Conveyor includes two reversible control stations (top & floor) for "plug & play" convenience. In-feed is 30" above ground floor. Discharge is 30" above mezzanine floor. Inclines are easily adjusted up to 30 degrees. Adjustable universal channel guard rails are installed on both sides for product protection. 1HP/115volts/1ph brake motor. Reversing Magnetic starter with 2 up / down/ stop push button stations (one at each end). Conveyor has 65 fpm (feet per minute) constant speed. Important note: With a 1 HP motor and the length of this unit, the maximum total live conveyor load is 75 pounds, with a maximum of 100 pounds per linear foot. Contact us and we'll get started. You can specify this mezzanine, but many variations of size, number of pick faces, and other options are yours for the asking. We'll design a modular parts storage department that fits your needs like a glove. If you require high-speed order fulfillment and inventory management, ask about our carousel, pick-to-light, and software driven solutions. Other methods are available for elevating product from ground to mezzanine, including vertical lifts, VRC's (vertical reciprocating conveyors), other conveyor types and automation. Contact us for assistance. Consider it a starting point - what can you do with a mezzanine in your operation? Durable shelving provides 7,000+ cubic feet of storage, 10,000+ pick faces. Shelves each have 36 cubic feet of storage space. This module brings you 7,128 cubic feet of storage space 3,960 on the floor level and 3,168 on the mezzanine level. Shelving units are high-capacity rivet shelving, each with five shelves. Double-row shelves are 36" wide, 18" deep, 84" tall and have 1,720 pounds capacity. Adding optional 6" x 18" standard shelf bins creates 10,000 pick faces in this layout.